I can easily see a run of dinosaur onesies flying off the shelves, as kindergartens and foundation classes stage their own dinosaur discos, thanks to this fun, rhythmic story by Deborah Kelly and Daron Parton. I can’t imagine trying to work tricky dinosaur names into a flowing, engaging rhyme, but Kelly has created an entertaining and educational text that will delight younger readers. The fully bled pages of illustrations by Parton beautifully represent each dinosaur character. 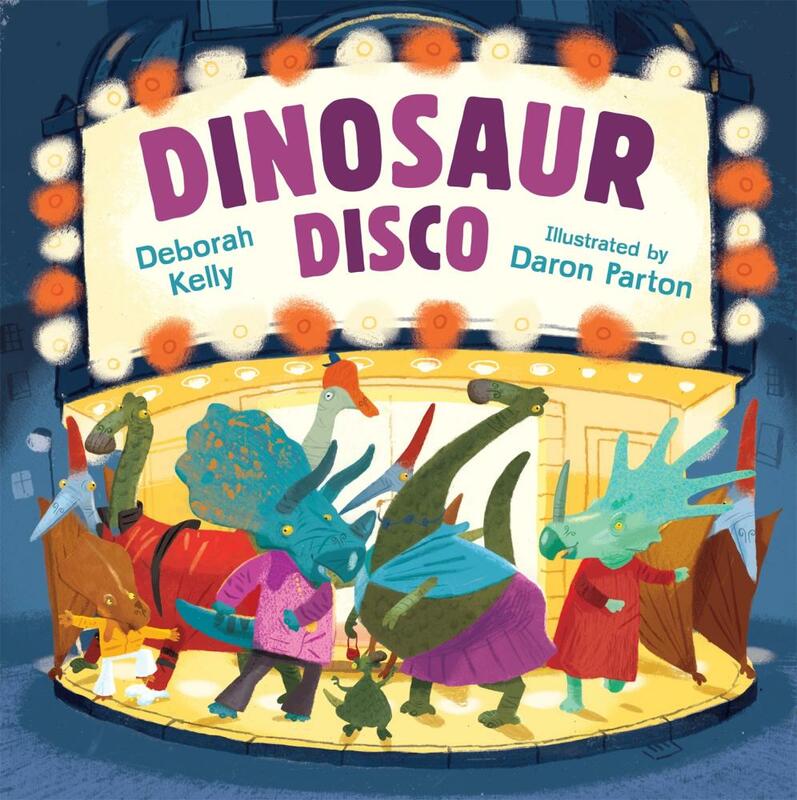 The bright textural pages delightfully place them in a social scene that assists with understanding dinosaur characteristics like size, diet and physical attributes. Kelly has understood this age group’s love of music and movement by creating a disco setting, allowing for humorous images involving flared pants, gold chains and polyester shirts, now thankfully as extinct as the animals wearing them. The facts at the end of the book will make this a great addition to classrooms and give plenty of opportunities for further learning and discovery. Clear, large text makes the rhyme easy to read among the rich bright palette of aubergine, orange, green and red and the sprinkling of light across each page keeps us under the ‘mirror ball’ throughout the book. Deborah Kelly’s previous titles include The Bouncing Ball, Jam for Nana and Haiku Journey. She will be releasing Ruby Wishfingers in 2016 with Wombat Books. Daron Parton’s alphabet book Alligator in an Anorak was released in October 2014.